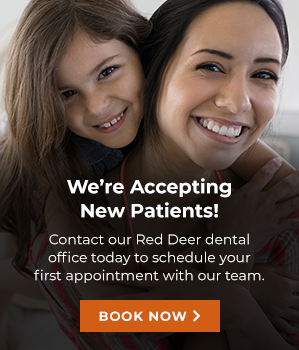 If you're looking for dental implants in Red Deer, ask your dental team at Southpointe Dental. Dental implant and implant restoration are options we provide to replace missing teeth. Dental implant restorations involve placing a titanium implant into your jawbone to replace the missing tooth’s root. An artificial tooth is then placed on top of the implant to fill in the space left by the tooth. Once the implant is placed, your tissues will slowly heal around it, keeping the implant in place. Implants are strong, durable, and provide a natural look to your smile. Compared to conventional dentures, implants won't become loose or slip out. You can begin to speak, chew and smile without the problems that missing teeth may present. Dental implants look and feel just like a real natural tooth. Patients with healthy gums and plenty of jawbone tissues are the best candidates for dental implants. To find out if dental implants are right for you, contact us your Red Deer dentist at Southpointe Dental.